As dedicated and loving dog people, we all take a bit of bad dog breath as par for the course for all the love and loyalty they show us everyday. With everything our pups get into, it’s no wonder that surprise face lick doesn’t always come with a minty fresh scent! If your dog’s breath is consistently bad enough to make you avoid close contact, however, there may be an underlying dental problem that needs to be addressed. Periodontal disease can have serious implications; from tooth loss and jaw damage to heart disease. As February is National Dog Dental Health Month, we thought we’d take this opportunity to impart some tips and tricks to keep your best friend’s chompers as healthy as possible! While it may seem odd to brush your dog’s teeth, it is actually a very effective way to keep plaque, gum disease and bad breath at bay. 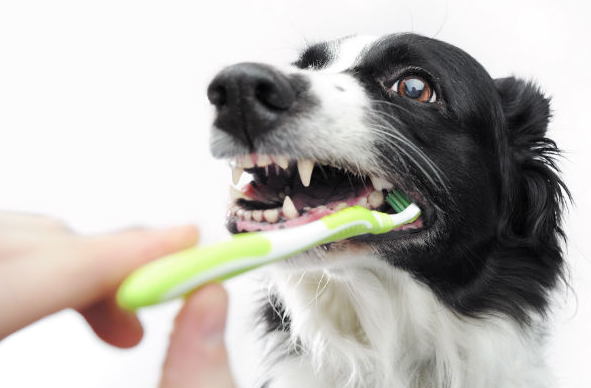 Some pups may be more receptive to having their teeth brushed than others, so it’s important to reinforce positive behavior and introduce this process slowly. The Vetoquinal Enzadent toothbrush is a popular option and has an extended handle and dual brush ends for both small and large teeth. Though it may be obvious, it’s very important to use dog-specific toothpaste as human toothpaste is toxic to dogs. Sentry Petrodex toothpaste comes highly recommended in fighting bad breath and plaque, and its chicken flavor will have your pup looking forward to brushing time! Dental chew toys are a fun and easy way to keep your pup’s teeth healthy and clean while satisfying their natural urge to chomp! 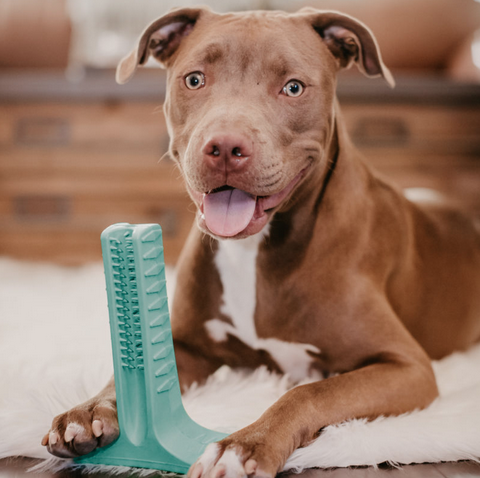 These toys work using ridges, bumps and bristles that clean plaque and stimulate healthy gums as your dog bites away! The Benebone Dental Dog Toy is a popular, super durable nylon option that comes in natural bacon and peanut butter flavors to keep your pup interested! As with most dental toys, the ridges help remove plaque and tartar in between brushing while keeping your dog occupied at the same time! Dental treats are a tasty yet still very effective way to keep up with your dog’s dental health! These treats work similarly to dental toys as they clean teeth, freshen breath and maintain healthy gums as your pup chews. The difference with dental treats is their digestible ingredients that your pup can enjoy with added health benefits! There are numerous dental treats on the market, including the popular and highly recommended Blue Buffalo Dental Bones. 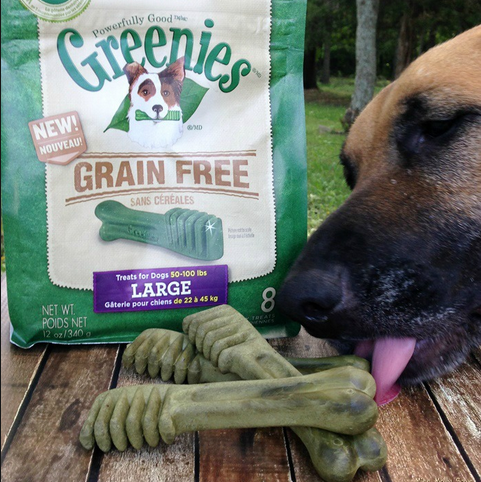 These treats have a meaty flavor even the pickiest dogs love, are grain-free and made in the USA for quality assurance! Dental health is a too-often overlooked aspect of your pup’s overall health and well-being. Keeping up with brushing your dog’s teeth at least three times a week, providing them with healthy and safe toys to chew and maintaining regular vet checkups all contribute to maintaining healthy teeth and gums. The next time you find yourself getting bombarded with some less than minty fresh kisses from your pup, keep their dental health in mind and make sure that smile stays as cute as ever!